My location was inside the iPhone Apple store in Reston, VA. I disabled all WiFi connections during the test. The business manager of the store watched me perform the test and couldn’t believe the results. Let’s go over the numbers. Let’s start with the Ping stat which measures network latency–This is amount of time when a request is sent from the device to when the first response arrives. You want the lowest number possible. It’s like if you typed in a URL in your browser and measured the time it took when you first hit enter, to when you first saw content displaying on the page. It took AT&T almost a half second while Verizon was a fraction of that time. Let’s look at download speed where we want the highest number possible. 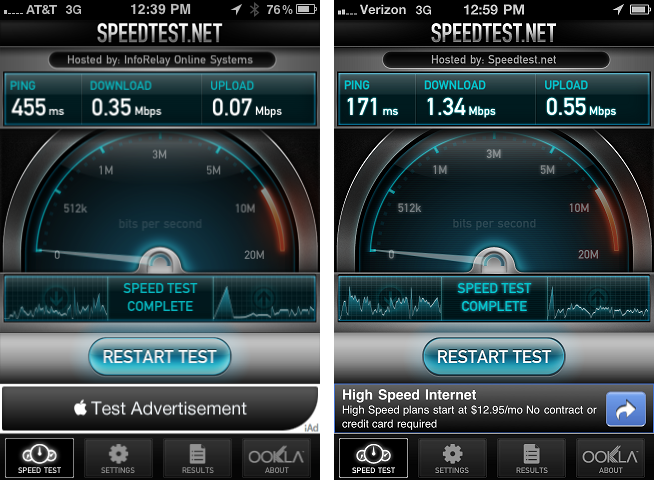 Verizon killed it with 1.34 Mbps while AT&T struggled at 0.35 Mbps. That’s almost 4 times faster. Upload speeds for Verizon were even better. Does this test really mean anything? Probably not for most people unless they only use their phone in that single spot I tested from. It does mean something to me–The latency, download, and upload speeds for Verizon was a pleasant surprise. The numbers were pretty good. It really comes down to this–Do you have good coverage and signal quality in your area? I along with millions of other customers did not have good AT&T coverage in the areas I spent the most time. Like my house, for example, which was always searching for an AT&T signal. I was able to talk on my Verizon iPhone for hours today without a single dropped call, both while driving and in my house. I’ve been waiting a long time to use my phone to actually make phone calls. Thanks Verizon. This entry was posted in iPhone on February 10, 2011 by todd.